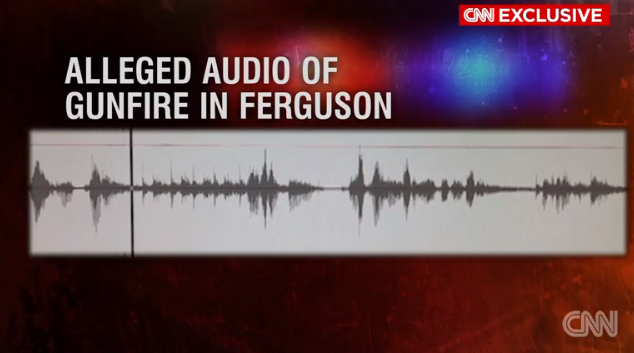 Michael Brown audio: 10 shots heard in alleged recording. The man who made the recording said through his attorney that he was interviewed by the FBI. Attorney Lopa Blumenthal says the recording was made during a video chat. The audio captures what seem like 10 gunshot sounds—an initial group of six, then a pause, then four more. An autopsy of Brown’s body performed at his family’s request by an experienced forensic pathologist named Michael Baden indicated Brown was hit by at least six shots. Eyewitness Dorian Johnson, a friend of Brown’s, has said that officer Darren Wilson fired several shots at Brown after Brown had turned toward him and raised his hands. The Baden autopsy indicated that Brown had been shot exclusively in the front of his body. Blumenthal says the man who made the recording has spoken to the FBI.